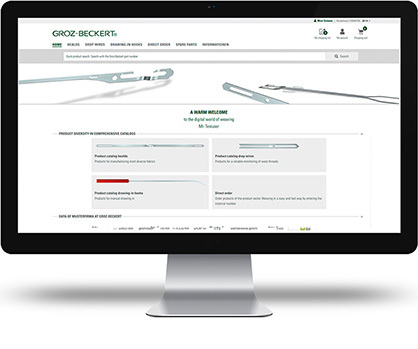 The Customer Portal Weaving opens up the Groz-Beckert weaving digital service world. Groz-Beckert customers not only benefit from a wealth of additional services for their weaving business, but also have access to a wide range of product information, as well as the products they are looking for. Which product best suits my needs? The comparison function can help customers answer this question. All the necessary product information can be accessed quickly and they receive an overview of the differences and similarities between the potential products. The customer portal also offers a wealth of information on weaving technology. 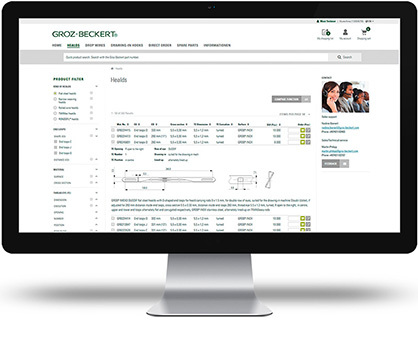 For Groz-Beckert customers the Customer Portal Weaving is available free of charge. The Customer Portal Weaving makes buying products even easier and more convenient – customers can now order their chosen products around the clock. Once they have registered, they can place their orders with just a few clicks. A detailed product description, images and information are available to help them select the best product. Via a personal account, customers can manage orders and invoices, as well as shopping list and order templates, directly in the customer portal – this saves time and ensures that they always have a clear overview. With the wide selection of order options available, it's up to the customers whether they place their order directly from the product catalog, via direct order or Excel upload. They also benefit from up-to-date price and shipping information. Customers can register for the Customer Portal Weaving online at any time. After receiving the personal access data, they can log in directly worldwide at any time. A wide range of products is already available online in the Customer Portal Weaving.